Fun fact: I taught English to Manuel Fraga and Gregorio Lopez-Bravo's grandsons. What do you all think of Franco's Opus Dei cabinets? If I knew what Opus Dei is, I could comment. There appear to be positive and negative associations within traditionalists. The assessment of Franco as a reactionary traditionalist as compared the fascist label is appealing to consider. Regardless of his political label, it is understood that he attended Mass everyday and prayed a Rosary. I would assume to that he kept a routine of mental prayer and spiritual reading. Such leader bears fruit for Heaven, i.e. sanctified souls. That is the ultimate common good(pinnacle) and therefore must be admired. Not to mention smacking the snot outta commies. Re. Opus Dei cabinet: Ricardo De La Cierva deals with this subject, and he stated that the greatest number of O.P. Members that were in Franco's Cabinet at one time was 3 (going from memory). But Franco included them more as "technocrats" than as bearers of an set ideology. Franco's ideological formation was more Hispanist and Catholic than anything else. He did admire Jose Antonio De Rivera, without adopting all his agenda. But also J.D.R. Himself, while starting off as a Fascists and admirer of Benito Mussolini, drifted away from Fascism and was evolving, where to? Its hard to define, but he was definitely a Hispanist himself. "Hispanist" or in Spanish: "Hispanista"; believed in the universal Hispanic ideals of Catholicism and Hispanic culture and brotherhood, embodied by Spain and Portugal in their providential mission of colonization and evangelization. I can't recall the source at this point, but at one time I read an analysis which claimed that Franco's aims were betrayed by his Opus Dei cabinet members. If you want to read a better source on the Spanish Civil war, try Stanley Payne or Burnett Bolloten. 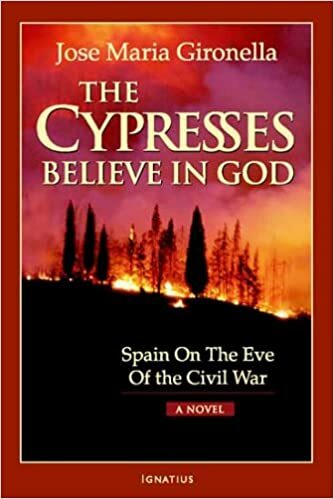 The best source, in so many ways, is to read "The Cypresses Believe in God." It gives you an in-depth portrayal of the Spanish Civil War in a way that makes you feel like you lived through it yourself and really know these people. Most people only read the first novel, but it's worth reading the entire trilogy. One of the best novels I've read. Very informative and never gets dull. His portrayal of the different factions during the Spanish Civil War, from the throne and altar Catholics, to the anarchist, communists, free masons, to the republican Catholics, it's all really interesting and the characters are great. You won't forget the ending as it's one of the most beautiful and powerful moments in any novel I've read. This book is a must read. I think of it as War and Peace was to the napoleonic wars, this is to the Spanish Civil War. I used to correspond online with a Valencian who was an Hispanist/Iberist. He was adamant that Portugal's rightful place was within the Spains. I'm not sure if this is an integral part of Hispanism but it seems to be a fairly common view among modern Hispanists. There is an interesting forum dedicated to Hispanism that's still up and running. Interesting to note that Portugal has a sub-forum under the "Foral Lands" section. I suspect this would have my grandfather doing cartwheels in his coffin, ranting about that blessed day when St. Nun'Alvares Pereira smashed the Castilians and Brites de Almeida took her shovel to their skulls. Yes, the Portuguese are not overly fond of the idea, to say the least; but considering that Spain and Portugal were once during Roman and Visigoth times one realm and that the crowns were united under Philip II; also that the Spanish and Portuguese royalty intermarried frequently; that they are united on one faith; its not difficult to see the attractiveness of this idea. I remember reading in I believe "The Liturgical Year" by Dom Prosper Gueranger O.S.B. His proposing a Catholic union of France and Spain, or lamenting the fact that it was thwarted by the enemies of the Faith.